A baby's vaccination is prepared at the Mahatma Gandhi Clinic in Livingstone, Zambia. There's been a recent increase globally in outbreaks of vaccine-preventable diseases. This can be seen in recent measles outbreaks in parts of the world where it was thought to have been eradicated. 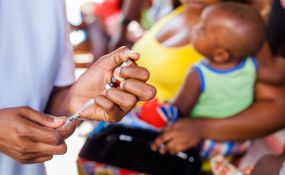 This has prompted the World Health Organisation to list "vaccine hesitancy" (the reluctance or refusal to vaccinate despite the availability of vaccines) as one of 10 global health threats in 2019. We are involved in projects at the South African Research Chair in Science Communication at Stellenbosch University which explores vaccine communication. In a world where people are increasingly encountering science information online, particularly on social media, it's important to understand why people are vulnerable to anti-vaccination messages and why this kind of information spreads so easily. In recently completed research, author Francois shed some light on how the anti-vaccination movement uses social media to amplify doubt and fuel hesitancy. The research found that "anti-vaxxers" select and share scientific information from open access journal articles on social media to escalate uncertainty in the broader population. Most online media don't benefit from the quality control of journalists and editors that shapes the content of traditional mass media. Consequently, content is generated by experts and quacks alike, and opinion and facts become blurred. This makes it hard to judge if information is credible or not. To complicate matters, people are able to create virtual communities of like-minded individuals who seek out information sources that they feel comfortable with. So people get more information they already agree with and few (if any) alternative views in online "echo chambers". This results in anti- and pro-vaccine messages being shared and replicated in isolated groups, which polarises the contesting views even further. So how can false information about vaccines shared on social media be countered? Scientists may think that sharing peer-reviewed, factual evidence about the safety of vaccines could change people's views. Sadly, this is not the case. That's because a lack of information is not the problem. The issue is the way people process that information. Sometimes, people simply "refuse to know" what scientists are trying to tell them. This is what may cause vaccine opponents to reject years of research proving that vaccines don't increase the risk of autism, even in vulnerable children. Facts may even backfire. Research shows that bombarding vaccine-hesitant parents with evidence about the safety of vaccines may make them more vaccine-resistant. These studies confirm that it's particularly difficult to dislodge incorrect information from someone's memory. And it's possibly even harder to change a person's mind if they hold strong beliefs about a contested issue. People's views about contested issues in science are polarised by "cognitive bias" and "motivated reasoning" that result from their personal beliefs and values. If they are inclined to like new scientific information, they will view it more positively. But if new information dispels preexisting views, they won't be receptive. The so-called "negativity effect" also comes into play. People are more likely to share stories and images about harm and tragedy, than neutral or positive content. This explains why messages about the alleged dangers of vaccines, often accompanied by emotive images of sick children, are amplified more powerfully via social media compared with pro-vaccine messages. The objective is to understand the nature and origins of anti- and pro-vaccination claims and images, as well as to explore the evidence provided in support of these claims. It's hoped that a better understanding of claims made by these opposing groups via social media may provide a starting point for constructive dialogue between these groups.